32 page booklet, well illustrated, English text. Dated September 1990 and covers 1990-1991 models. 12 page booklet, well illustrated, English text. Dated October 1990 and covers 1990-1991 models. 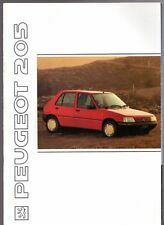 A rare original Peugeot 205 Trio brochure dated Oct 1990 for UK market. Brochure is small format 6pp illus in colour and is in very good condition. Original Dutch market Sales Brochure for the Peugeot 205 Cabriolet. 8 page, well illustrated, colour folder. Dutch text. No Publication Number. In good condition, dealer stamp to front cover. Size 21cm x 29.5cm. A rare original Peugeot 205 CTi Cabriolet press photo undated c1990's. Photo is illus in b/w and is in very good condition. 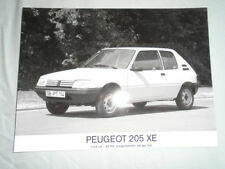 A rare original Peugeot 205 XE press photo dated c1990 with German text. Photo is illus in b/w and is in very good condition. A rare original Peugeot 205 GR press photo dated c1990 with German text. Photo is illus in b/w and is in very good condition. A rare original Peugeot 205 CTi Cabriolet press photo dated c1990. Photo is illus in b/w and is in very good condition. 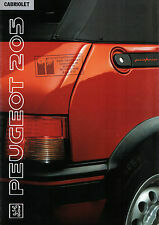 PEUGEOT RANGE orig 1990 UK Mkt Sales Brochure. 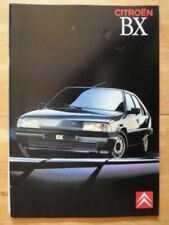 This is an original factory issued sales brochure on the Peugeot Car Range from October 1989 (1990 model year) with 16 pages / sides (including covers) and English text for the British market. A rare original Peugeot 205 GTX Special Edition brochure undated c1990. Brochure is 4pp illus in colour and is in very good condition. Dated October 1990 and covers 1990 models. Good condition; small stain to lower right area of front cover, light marking to white rear cover. 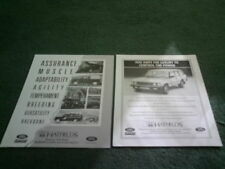 Original UK market colour sales brochure being a factory issued reprint of a group test from What Car?. Dated June 1990 and covers 1990 models. 12 page booklet, well illustrated, English text. 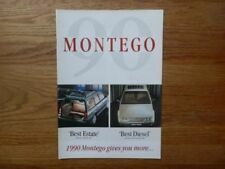 Nice small-format brochure featuring the Peugeot 205, 309, 405 saloon & estate car and the Peugeot 505 saloon/Family Estate. Two pages per model with pictures and brief specification. (Note this was the last year that the 505 saloon remained on sale with the Family Estate carrying on to 1992.). We don't haggle over prices before or after sales. If there's a problem with your order get in touch. Double sided single sheet, illustrated to the front only, English text. 21x30cm approx. 52 page booklet, well illustrated, English text. Dated September 1990 and covers 1990-1991 models. 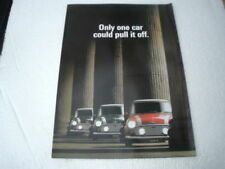 Original UK market Sales Brochure for the Peugeot Range. 205 XE, XL, XLD, GLD, XR, GR, GRD, Automatic, XS, GT, D Turbo, GTi 1.6, GTi 1.9, CJ, CTi. 16 page, well illustrated, colour booklet. English text. 16 page booklet, well illustrated, English text. Dated September 1990 and covers 1990-1991 models. 8 page folder, well illustrated, English text. 21x30cm approx. 16 page booklet, well illustrated, English text. Dated October 1989 and covers 1989-1990 models. Very good condition; dealer stamp to front cover, rubbing to white rear cover. 48 page booklet, well illustrated, English text.